This tutorial is just for design and fun. What we aim here is to transform your texts to Twitter looking style and make it tweetable with a single click of a button. nT += "<hr class='tweetHr' /><div class='tweetFooter'><a target='_blank' href='http://twitter.com?status=" + t.substring(0, 137) + "...'>Retweet &#8594; </a></div>"
Upong searching on these items on the text, we need to replace them with a HTML link tag and assign a corresponding link for them. For a link, we just simply use the text itself. It's already a link after all. Another cool feature about this too is the ability to make the text tweetable. What we did is to simply add a link below and attach the following URL in it: http://twitter.com?status=INSERT-TEXT-HERE. 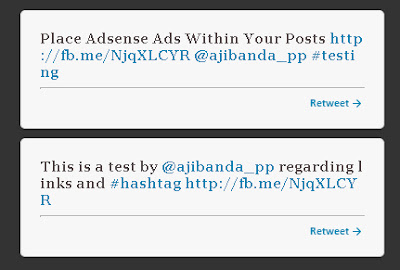 This automatically directs you to a status box ready for clicking in Twitter.